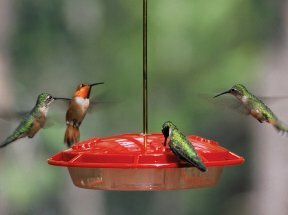 We have been recommending that you leave hummingbird feeders up until Mid-October while migrating birds make their way south. However, we received a letter from one of our newsletter readers that she has seen hummers later than that in our area. Therefore, you may want to leave a hummingbird feeder up a little longer. It surely will not hurt to leave a feeder up until freezing weather sets in. Below is the letter from MaryAnn who lives in Villa Ridge, Missouri. I’ve noticed on your newsletters that you routinely advise taking down hummingbird feeders in mid-October. I just wanted to let you know about my experience in Villa Ridge. I usually have 4-5 feeders hanging in various spots in my large yard and as the season ends I used to take them down one by one leaving one up till the end of October “just in case.” One year on Halloween I was literally reaching up to take the last one down and a little male swooped in and gave me a look like “Don’t you dare!” Ever since then, I always leave the last feeder up till a couple of hard frosts or the end of November now “just in case”. Just because you’re not seeing/hearing any doesn’t mean that there aren’t any stragglers left…who will be very grateful for finding your feeder. I (and any straggler hummers) would appreciate it if you changed your advice. Thank you, MaryAnn, for sharing your hummingbird experience with us. All readers are welcome to send us comments or insight from their experiences in any area that relates to our offerings at Hillermann’s. Send an email to hillermann@hillermann.com or send a letter to Hillermann Nursery & Florist, PO Box 1160, Washington, MO 63090.